Thanks to my friend Annie. The Actors are all very Good but Eva Stands out and I think is GREAT…!!!! Great all around production as I am impressed!!!!!! Thanks Annie and Mariana. I found this video. Eva speaking French. Seems new to me. As George said before very Green 2011 it is. The greener the better. Yippee!! I found an interview of Eva on Youtube and is less than a minute, but its in French. I posted the link before but I guess its still under moderation. Search for Eva Green in Youtube and sort by “upload date”. 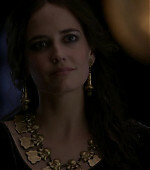 EVa was again truly amazing in the third episode of “Camelot”! I really loved all her scenes and the new character that was introduced named Vivian seems to be a great asset for Morgan. I REALLY loved the scenes between Morgan and Merlin. These two are the only reason why I watch this show. Arthur and Guinevere don´t interest me one bit but the teasing and taunting scenes between Merlin and Morgan are the greatest joy for me! Can´t wait for episode 4! I don’t have Starz so I’ve only seen the first episode (“Homecoming”), but I wasn’t all that impressed, I hate to say. It wasn’t awful, but I really feel like the writers didn’t do much to create a sense of place or time or even to develop any of its characters. Eva came off better than the rest, but even her Morgan was too straight up evil for my liking. Eva’s statements about the evolution of her character give me hope though. I’ll be keeping an eye on the show’s reviews. Have you guys seen the latest preview clip for this Friday´s episode! It is a really intense scene. Morgan is going to get really sick! Merlin´s warning about the use of dark magic will become true. BTW, Eva is truly amazing in this scene! You can feel her pain and desperation!